Auto-clutch manual vs. CVT automatic—which is better? Sport quad riders love their manual transmissions because of the absolute control they give over your machine’s power output. Plus, they can be more fun to ride. 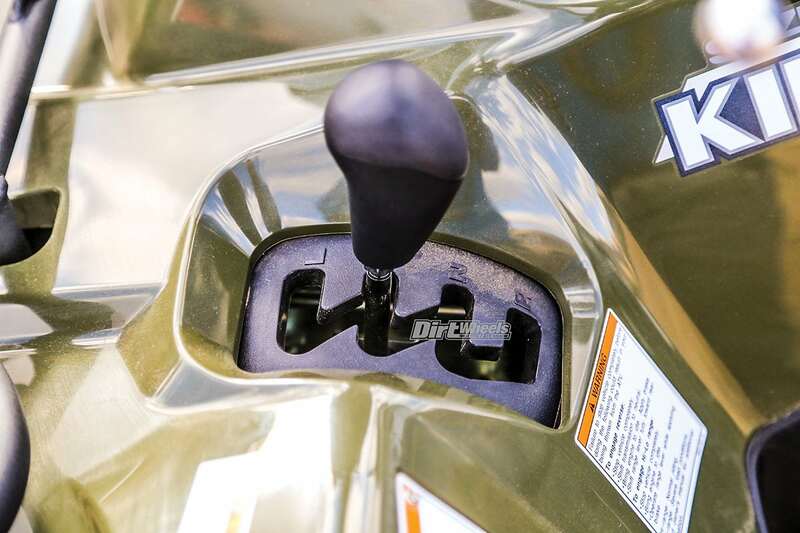 4×4 riders or ranch-goers tend to stick to automatic transmissions due to ease of use. Few 4×4 quads still offer manual shifting, but that is because customers demand automatic transmissions. Suzuki makes two 2019 KingQuad 400s. The ASi comes with a CVT automatic, and the FSi is a manual-shift five-speed with an auto clutch. We put them through their paces in multiple scenarios to see which was more fun and which was better suited for work. These aren’t sport quads by any means, but they are still a blast to ride. 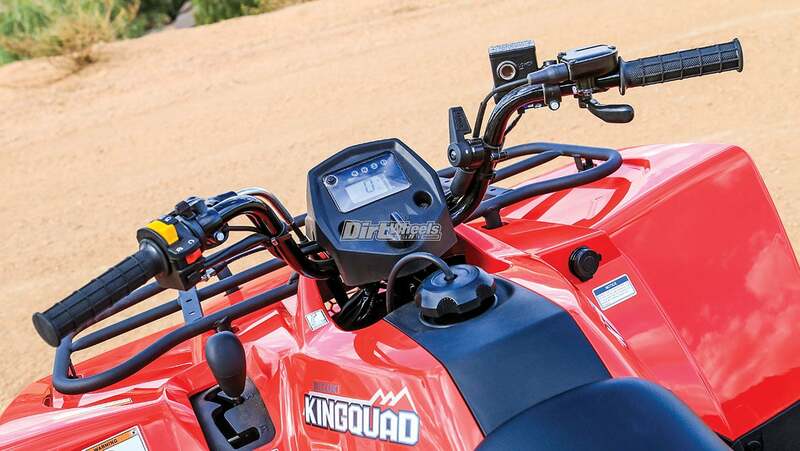 The starting price for a KingQuad 400 is $6499. The Flame Red KingQuad 400 FSi was easier to descend hills with since you could simply shift down a few gears with your foot to slow down. Both versions sport a 376cc, air-cooled four-stroke engine that is electronically fuel injected. Paired to the separate transmissions are front and rear differentials for the 4×4 system that turn the wheels through shaft drive. There is no front-locking differential on these machines, but the 4×4 system works quite well in most situations. The suspension utilized up front is a dual-A-arm design with oil-damped coil-spring shocks. Bringing up the rear is a straight-axle, swingarm-type suspension with dual-oil-damped coil-over shocks. 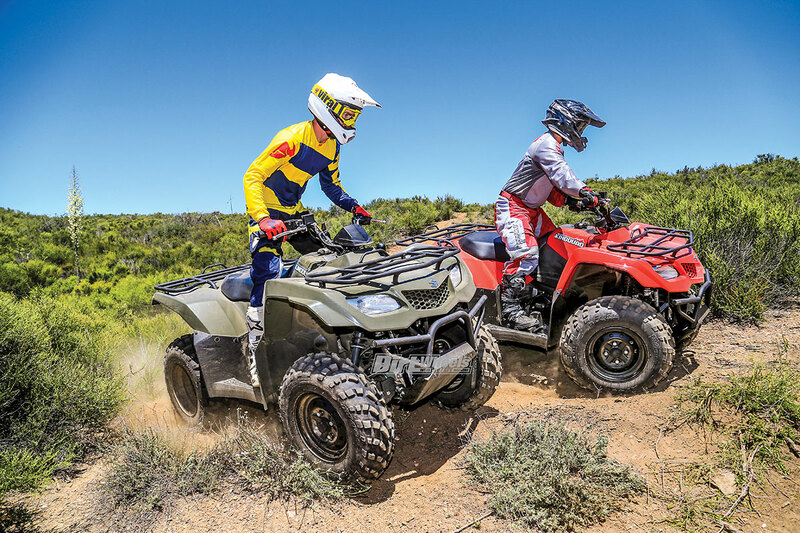 These ATVs are as basic as a 4×4 can get, and that is never a bad thing when it comes to reliability and durability. These KingQuads are perfect little tight trail machines and work great around the ranch or farm when you don’t need a lot of power. There are front and rear cargo racks and a rear receiver for a hitch ball to tow with on the FSi and ASi. The tow rating is under 1000 pounds. The Suzuki KingQuad 400s come in Terra Green, Flame Red, Solid White or Camouflage color schemes. These 400s have nimble handling and are quite comfortable to ride. The seat height and handlebar are sized well for midsize and smaller riders, but it can get somewhat tight for tall riders. Some of Suzuki’s KingQuads tend to have busy steering, but their 400s are more relaxed and easy to pilot. The cockpit of the KingQuad is roomy for most riders but a tighter fit for some tall operators. The controls are simple to use on both machines. There is a foot-operated rear brake that is connected to the lever on the left handlebar. The right handle holds the front-brake lever. Stopping power is strong with the front hydraulic disc brakes, but the rear drum brake is a bit soft. The ride on these machines isn’t the smoothest around since they have a solid rear axle, but they do handle very well around corners and across off-camber sections. The shocks are entry-level on the front and rear, so you shouldn’t expect them to be great. For the speeds you generally drive these 400s, you won’t need to worry about the suspension settings too often. Plus, the shocks are not adjustable. They handle slower-speed activities quite well though. A solid rear axle is employed on both 400 models. A dual shock setup is utilized as part of the suspension package. If you purely want the machine to get work done around the ranch or job site, then it comes with good options. 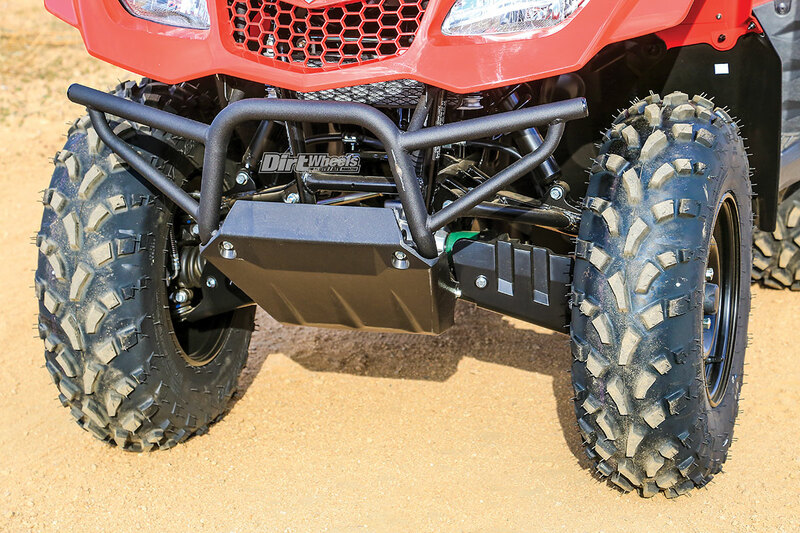 The front and rear of the KingQuad come with cargo racks that hold up to 66 pounds up front and 132 pounds in the rear. There is a hitch-ball receiver built into the frame of the machine so you can tow up to 992 pounds. 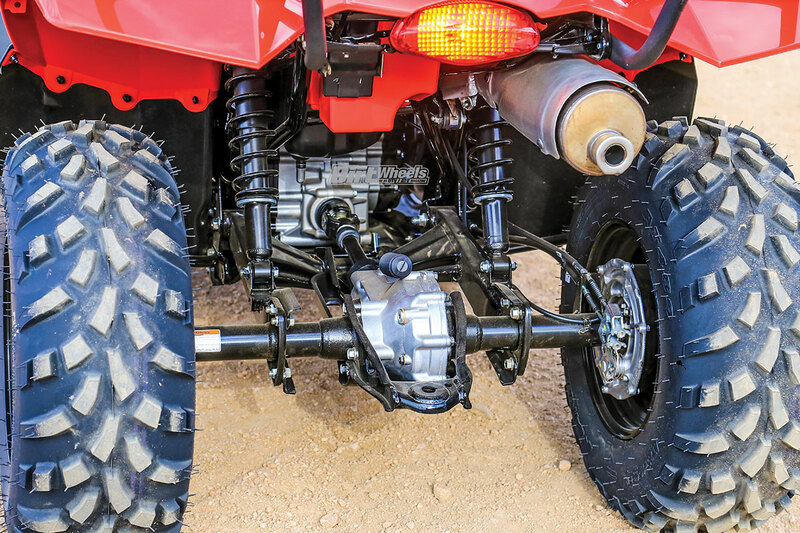 The front suspension is a dual-A-arm type that utilizes coil-over shocks to provide a reasonable ride over rough terrain. Now, let’s talk transmissions. 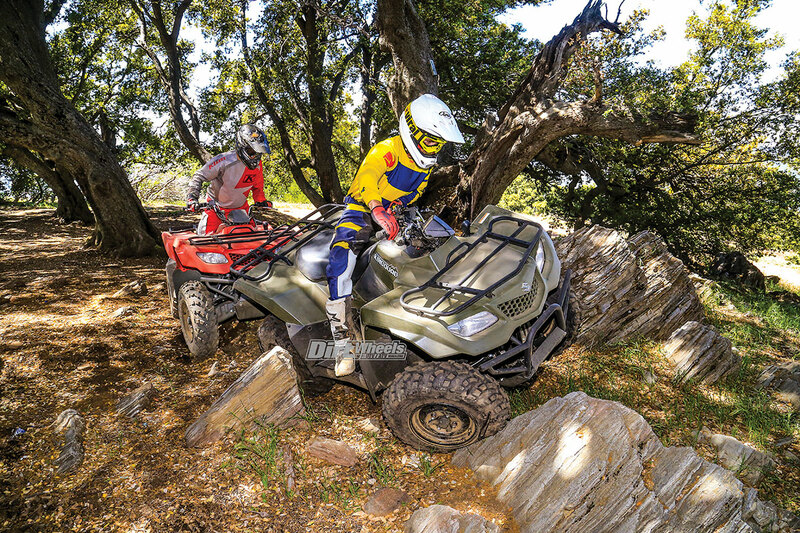 There is no doubt that the CV transmission is easier to use on the KingQuad 400ASi. There is no shifting required, unless it’s to go into low gear, neutral or reverse. Most of the time high gear is all that is needed for this quad to get around trails. It is true that a CV transmission could be less reliable since the clutching system utilizes a CVT belt that could get overheated and break. Realistically, though, this is not likely, since the machine has modest power output and weighs under 700 pounds. If you are a new rider or simply less experienced, an automatic transmission will be far more enjoyable to operate. There is less to focus on, which puts more of your attention on the trail ahead. Suzuki’s 400 ASi has a fully automatic CV transmission. You get a high/low forward gear and neutral and reverse gears. The best part about a manual trans is getting to shift gears and have your machine be in the power range that you want it in at all times. 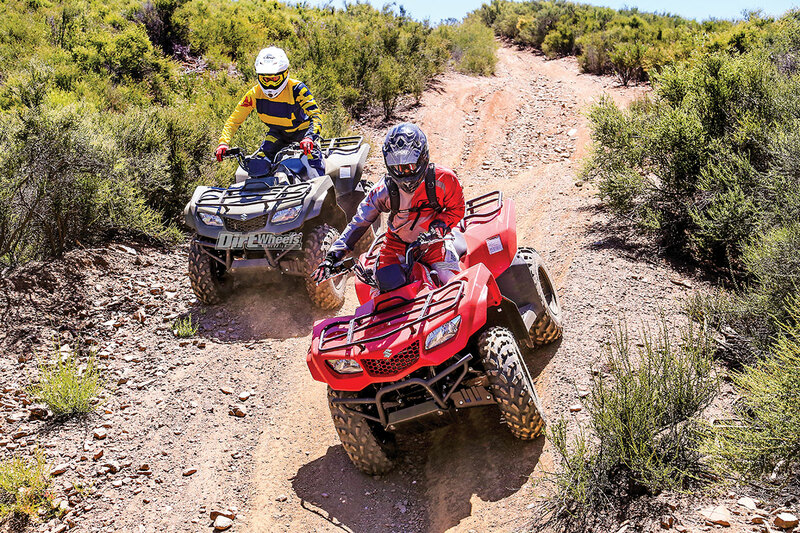 If you like to ride fast and aggressively, then the FSi is the better option of the KingQuad 400s. It is a letdown that the FSi doesn’t have a manually operated clutch, though. It technically comes with a five-speed manual-shift transmission and a semi-automatic clutch. However, for some riders who want to shift with less to worry over, you can shift gears however you like and don’t have to worry about operating a clutch. On the other side of the coin, the usage of a hand-operated clutch helps you put power down more in a manner you want. 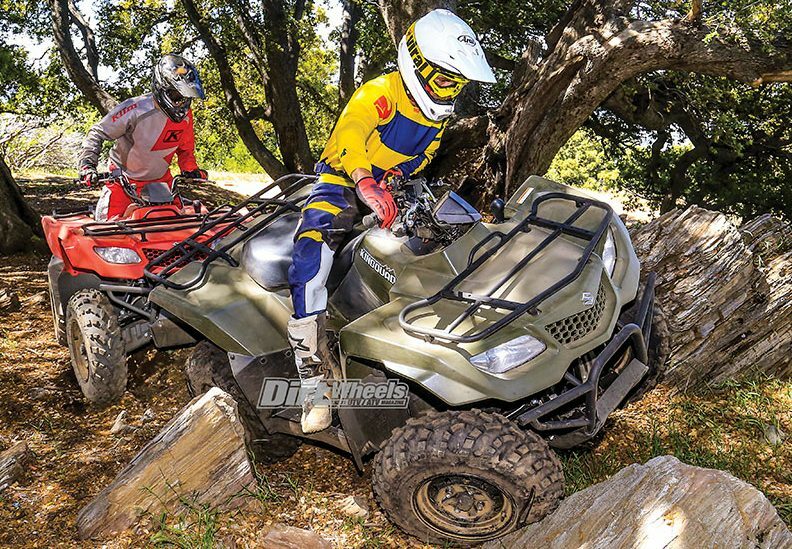 There is no doubt that this version of the KingQuad 400 is quicker in all aspects. We pitted the two against each other in a drag race, and the FSi got up to speed faster by a quad length. It is also easier to shift down gears on hill descents to slow the machine down with the FSi. The ASi requires you to stop the machine and shift it into low gear to descend hills slower. 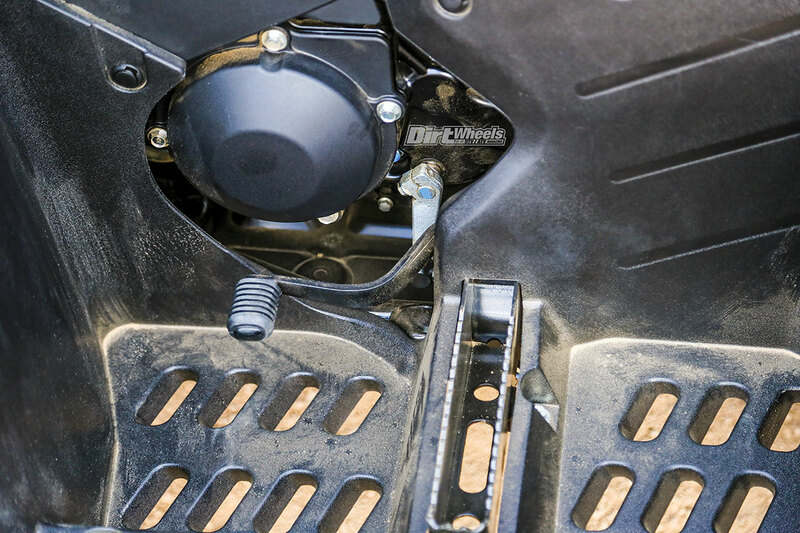 The 400 FSi has a foot-operated gear shifter on the left side of the machine. The shifter height is adjustable. The FSi downside we noticed the most is that it is more work to use. Changing gears into reverse requires that you shift it down with the foot-operated shifter into neutral, then use the hand shifter to change it into reverse. After that, you will have to utilize the hand shifter to go into the drive gear, then click the foot shifter into first gear to get going again. That is a lot of steps. There is no clear winner between the two different transmissions. Most of the choice would be with rider preference. If you like to go faster, the FSi is the clear winner. It holds the rpm where you choose and feels like it has more torque. If you want things to be easier and smoother to use, the ASi takes the cake. All you have to do is actuate the throttle to go, and the only time you need to shift gears is if you need to go quite slow up or down hills. Go to www.suzuki.com for more info on their full line-up of quality quads! Suzuki has sold many models of the ASi and FSi because they are simple, durable, and useful for recreation and utility. WORCS Round 7 – Polaris and Honda top the podiums!